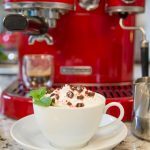 If you love Starbucks Peppermint Mochas, but hate the price, check out this delicious copycat recipe! We’re super excited about an amazing KitchenAid giveaway! 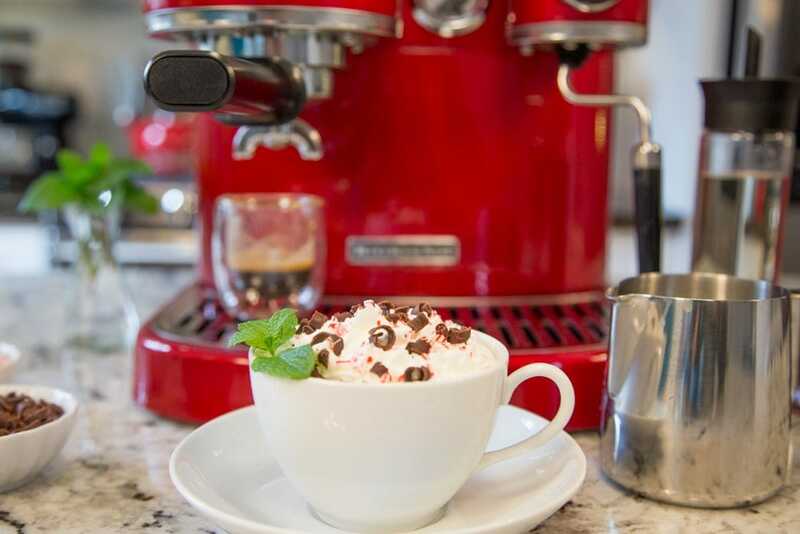 Actually, it’s beyond amazing, their spectacular KitchenAid® Pro Line® Series Espresso Maker in Candy Apple Red – and it could be yours. The giveaway guidelines are explained below, but we’d love to give you a little peek into how this beautiful machine operates. Scott, with our son Nick, put together a short video, featuring the espresso maker and my favorite seasonal coffee drink, peppermint mocha. The only place I’ve ever had the pleasure of enjoying a peppermint mocha is at Starbucks, but at more than $4 a pop (cha-ching! ), I have to restrain myself, as our budget just doesn’t allow frequent coffee indulgences. Until now, that is. Earlier this season, while still anticipating the first beloved chocolate and peppermint coffee drink, I got an idea. Why not figure out how to make these delicious drinks at home? 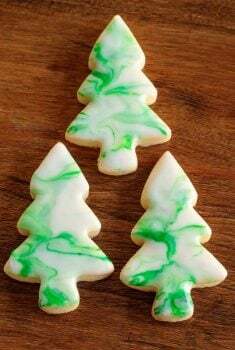 Although I have an espresso maker that makes a wonderful peppermint mocha, my challenge was to develop a recipe that didn’t require fancy, expensive equipment. A holiday classic made with our signature espresso, steamed milk, sweet mocha sauce and peppermint-flavored syrup. It’s all topped off with whipped cream and dark chocolate curls. That was a great start! They use two different sauces; a sweet mocha sauce and a peppermint flavored syrup. I did a bit of googling, tried a few different recipes and came up with my own versions. You’ll find the recipes below. The mocha sauce is wonderful drizzled on ice cream and makes wonderful hot chocolate when combined with milk and heated. 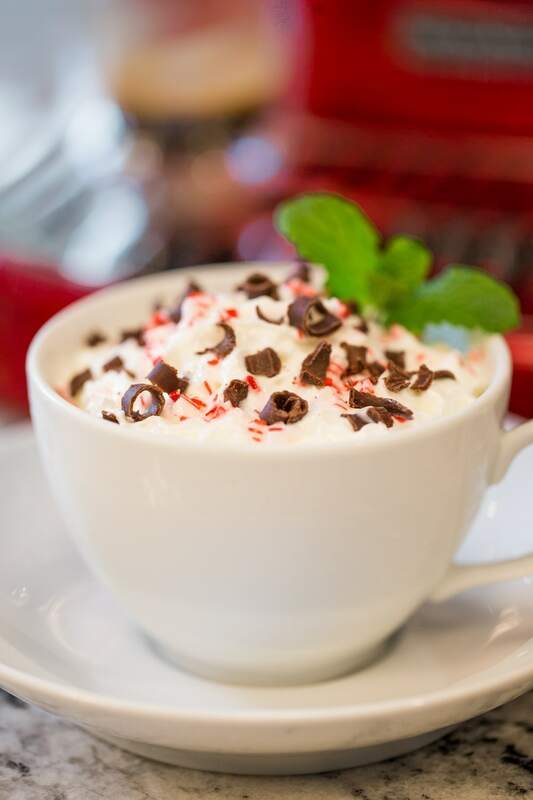 Add a splash of the peppermint syrup and you’ve got a delicious Peppermint hot cocoa, yum! Is steamed milk simply hot milk? Now for the steamed milk. Is steamed milk simply hot milk? No, not really. Steaming milk with an espresso machine does make it hot, but it also creates foam (microfoam) or tiny bubbles. Can this be done without an espresso machine? Yup! There are actually a few ways to steam milk without fancy equipment. One of the easiest ways is to purchase an inexpensive handheld “frother”. It’s battery operated and all you do is place in warm milk and give it whirrrr. There are also fairly inexpensive frothers that both heat and froth the milk. This Kuissential Deluxe frother is rated really well on Amazon. But guess what? You can create steamed milk in a clean empty glass jar! Yup, that’s all you need. Just fill the jar halfway full and shake, shake, shake until the foam has double in volume (30-60 seconds). Then remove the lid and warm the milk for 30 seconds in the microwave. The heat will actually stabilize the foam! Cool, huh? Espresso is hard to duplicate. It’s a fairly precise science, although there are some amazingly simple espresso machines that do all the work for you. 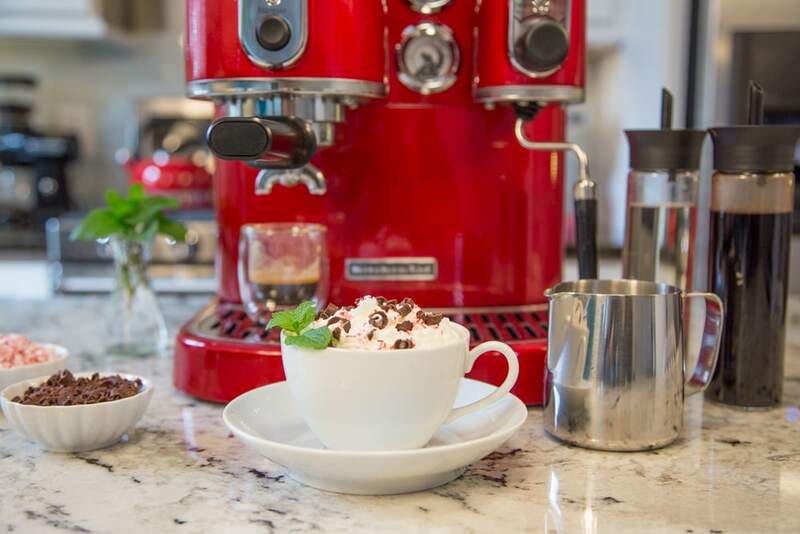 We love the beautiful KitchenAid Proline Espresso Maker you see in the pictures, but on busy days (that would be most days) we use our KitchenAid Nespresso Maker. Just slip in the pod, push the button and delicious espresso appears right before your eyes! It comes with its own Aeroccino milk frother so it’s super easy to make all the fancy coffee drinks at home. If you have a coffee lover on your Christmas list, this would make a lovely gift! Don’t want to invest that much? How about authentic, delicious espresso at home every day for less than $25? This stove top espresso maker works great and produces velvety espresso in less than 5 minutes. 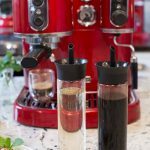 No espresso maker and you don’t want to invest in one? You’re okay on this front too. You can still enjoy peppermint mochas. It won’t be exactly the same, but it will still be delicious. Just brew coffee in a regular pot using fine grounds and twice as much coffee as normal. Brew the coffee and make your peppermint mochas immediately after brewing according to the directions below. So there you have it! 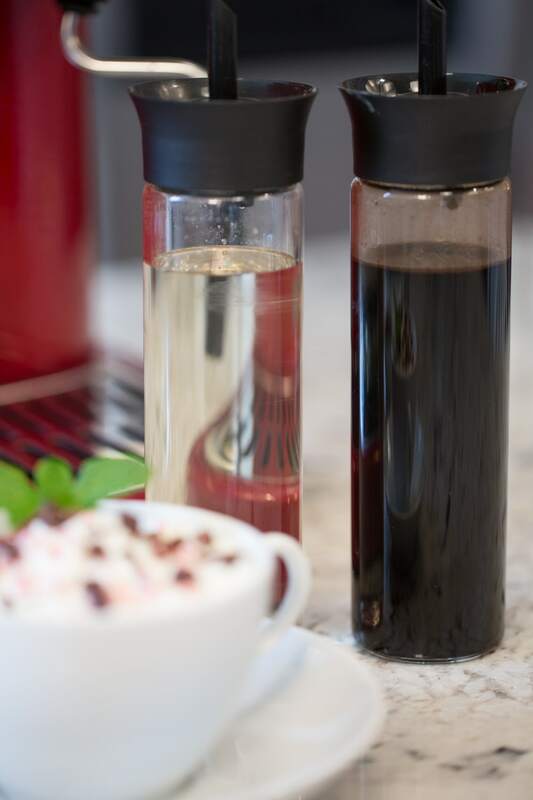 The syrups are super simple to make and will keep in the refrigerator for up to 10 days. You’ll find lots of other ways to use them, so they probably won’t last that long. They’d make a fun gift for the coffee lover on your list. Just find some fun, pretty bottles and fill them up! P.S. By the way, Nick who’s our coffee aficionado (aka coffee snob) says this Peppermint Mocha is better than Starbucks! Love this delicious seasonal Starbucks drink? Save money and make your own! Steam milk and add to cup. 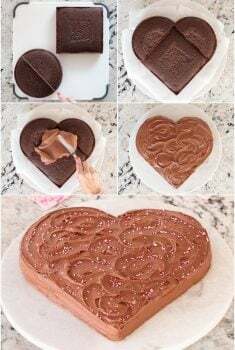 In a medium size sauce pan, whisk together the sugar and the cocoa powder. Slowly add the coffee (or water), whisking continually until all liquid has been added and mixture is smooth. Bring to a boil, then reduce to a low simmer. Watch pot very carefully, as you will have a huge mess if you walk away and mixture boils over. (Don’t ask me how I know this!) Simmer on low for 5 minutes. Cool completely then transfer to an airtight jar or bottle. Store in refrigerator. Bring to room temperature before using in coffee drinks. Combine water and sugar in a medium size pot and stir well. Bring mixture to a rolling boil over medium high heat. Stir to make sure all sugar is dissolved. 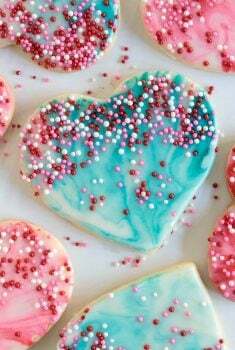 Remove from heat and add peppermint extract. Allow to cool, then store in refrigerator in an airtight container. Bring to room temperature before using in coffee drinks. I meant to comment a long time ago! So sorry . . . Thank you Chris, Scott, The Café, and Kitchenaid for picking me as the winner of this beautiful machine! Looking forward to its arrival to make the most delicious drinks that will be perfect for sipping on the cold days ahead. Hope you all are having a wonderful start to the new year. We’re so excited for you too Cathleen! We have a bright candy apple one, (just like yours!) on our countertop and love the delicious espresso it makes! It should be at your door very soon! I love the cold weather this time, which means warm blankets and hot coffee! ALSO breaking out the christmas tree and decorating with the kids! One of the best things about working in education is the extra time off around the holidays. 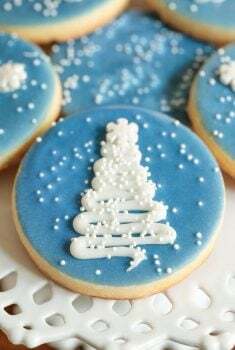 I cherish the time now afforded to try new recipes, plan and go to relaxing get togethers with family and friends and decompressing til the next semester starts up again. 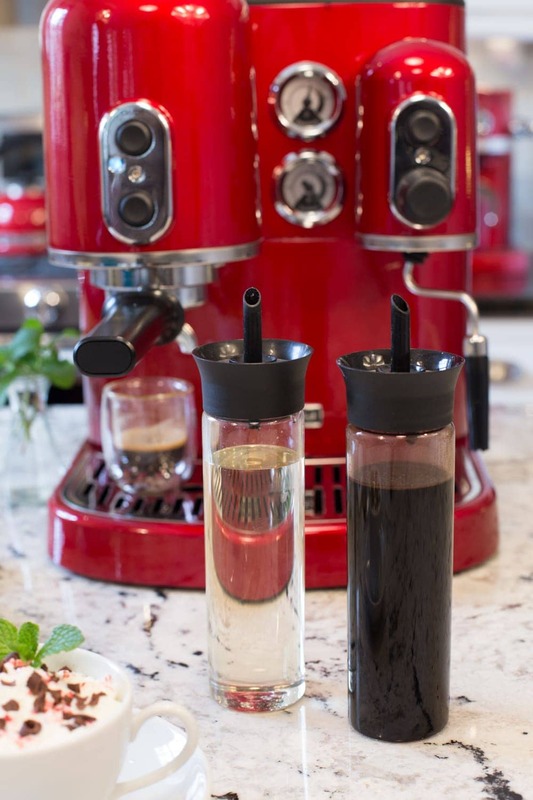 Would love to play with a new KitchenAid coffee drink maker, too! Following all dirrex to maximize my entries. Happy holidays! I love, love, love this copycat Peppermint Mocha recipe. It takes a few minutes to put the two syrups together, but we have enjoyed several cups of the wonderful-ness. No more expensive drive through drinks for us!! My favorite thing is seeing my parents — I don’t see them very often, so Christmas is always special because of that. That’s such an important part of the holidays Jennifer Anne; connecting with those close to us! The great holiday food and the cooler, and more reasonable weather here in south florida. It’s always a great break from the heat down there, isn’t it Nicole? I love being able to see my family all together! We do too Karrie! We just had a houseful last night and it was chaotic, wild and absolutely wonderful!